No more Grand Canal but a wonderful Palace representing me and all my guest dreams. In the glamourous location of Palazzo Contarini della Porta di Ferro you’ll live a magical Carnival Night. Delicious dinner and international shows will be the perfect frame for your special fun. A lifetime dream in the space of a night…. Sunset colors Venice with his wonderful shades and the lights are fading…. this is the special moment when the Past rise again…. 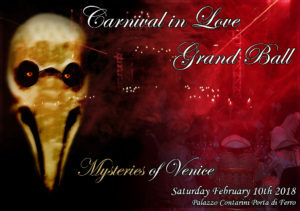 Are you ready to dive in a gothic, sensual, charming, mesmerizing Carnival Night? Are you ready to live the Misteries of Venice?